My first glimpse of Moab on Route 18 along the Colorado River. Where to begin... 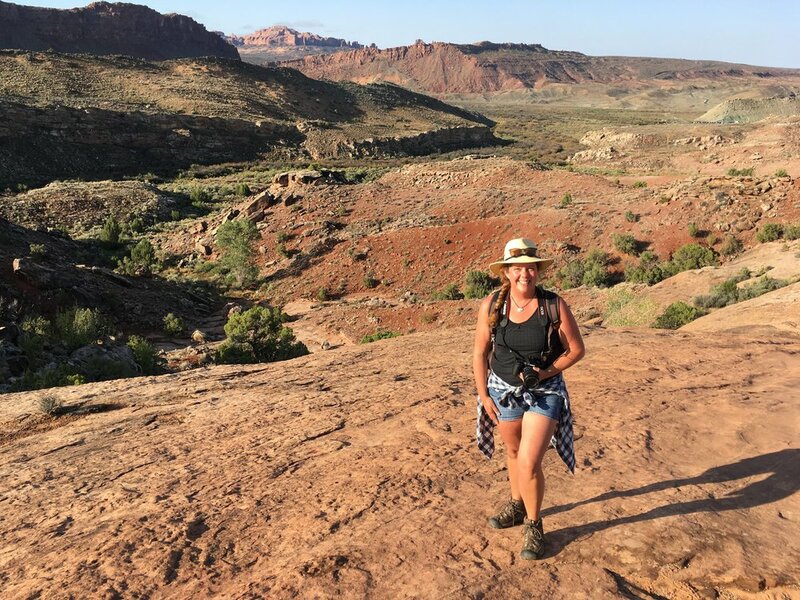 I arrived into the town of Moab via a bright and early sunrise drive down UT Route 128 in hopes of securing a campsite along the Colorado River (which I did!). Though I poured over books and websites for months in preparation for this trip, nothing can really prepare you for seeing this place for the first time with your own eyes! All I can say is it is eye candy for the artist's soul with it's geometrical shapes and forms begging for abstraction enhanced by the bright warm hues of the sand and stone popping out against the deep cool tones of the shadows...Have I lost you yet? Translation: It is nature at it's best and most complex. 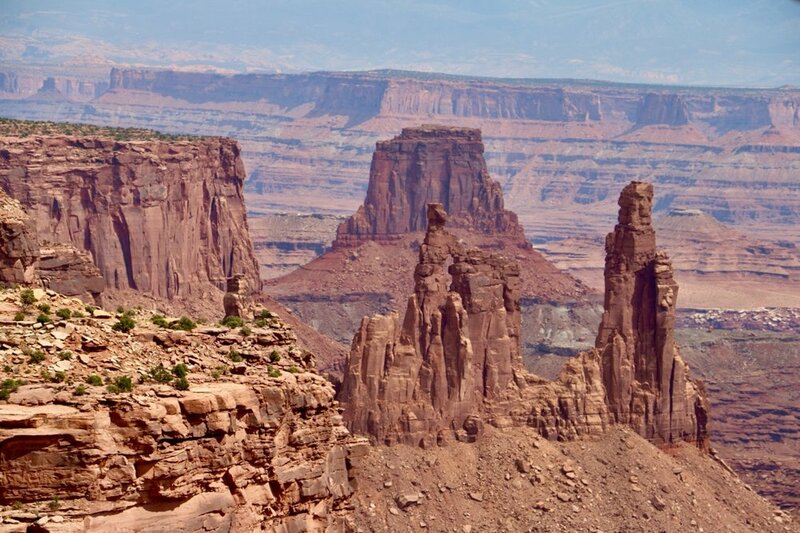 With that, the town of Moab is equal to it's surrounding landscape. 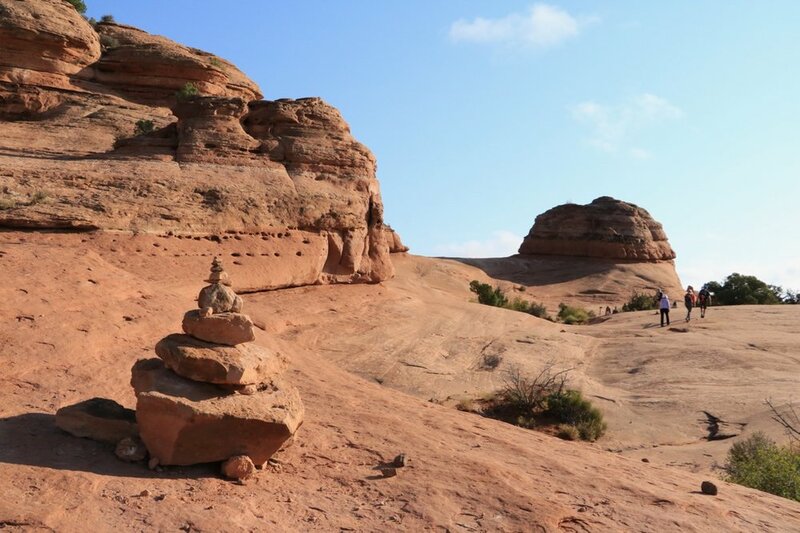 Not only is Moab a happening hub of "get outdoors" activity, surrounded on all sides by some of the most unique and amazing landscape on the planet, but Moab is also a town of people who care deeply about the environment. Because of this, Moab was the first town in the nation to be designated by the EPA as a Green Powered Community. Getting people in this town to engage in conversation about the state of the country, the climate, the parks, the planet,... was a piece of cake because these were the conversations already happening everywhere I went. They are knowledgeable, strive to be informed, passionate, and willing to lay it all on the line for the the future of our country and the planet. At the same time, the little town of Moab (pop, 4500) manages to be a low-key, hip, and funky little basecamp for over 10 million (yes million!) 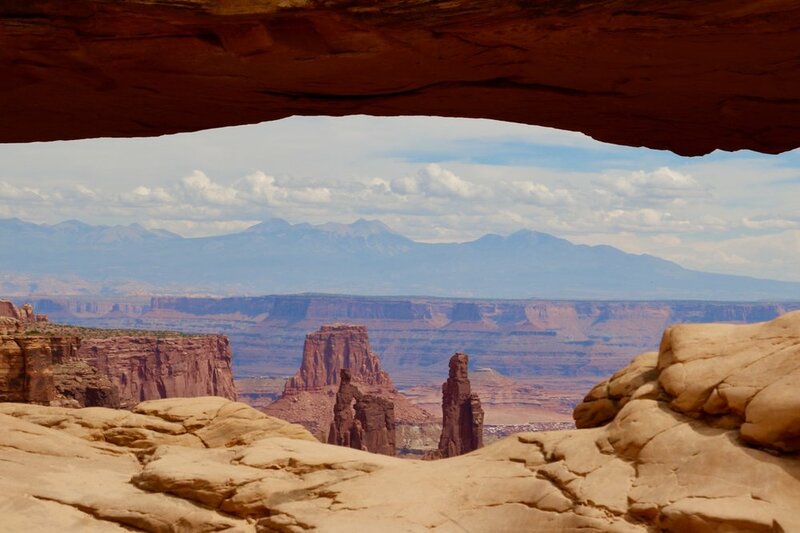 visitors a year that blow into town for a day, a week, or longer to explore nature's playground primarily in to form of Arches and Canyonlands National Parks. 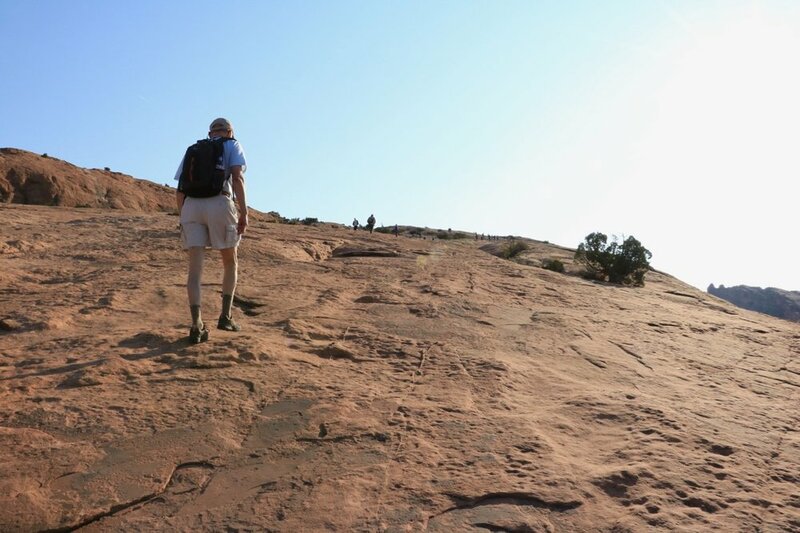 Moab provides everything you need in a low impact, tread lightly sort of step. First stop - my long awaited first glimpse at Arches National Park and boy I wasn't disappointed! 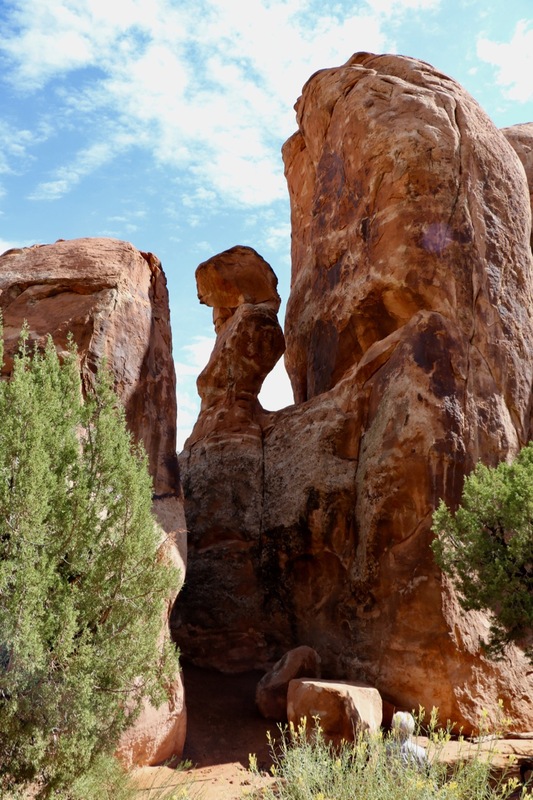 Arches is an landscape like you can't imagine until you actually walk, hike, and climb your way through the pillars, hoodoos, buttes and arches. 300 million years in the making, it is a breathtaking display of wind, water, heat and cold erosion that is constantly shifting and changing. 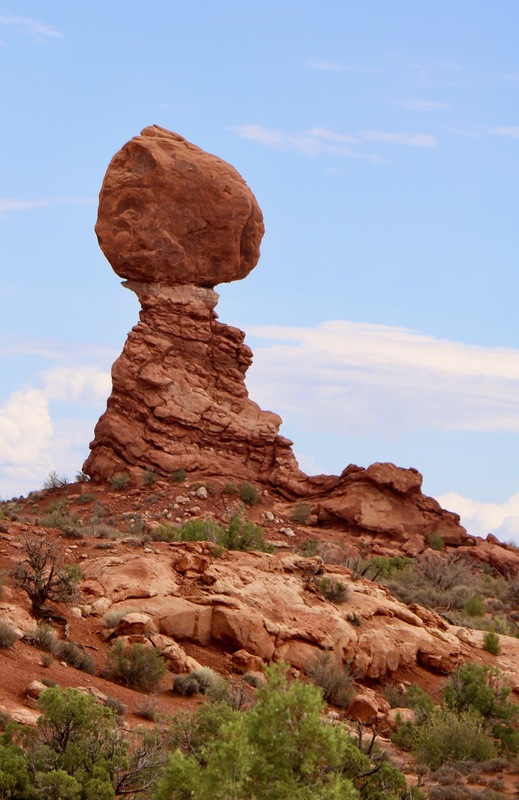 Nothing is permanent here and the rangers do all they can to slow the process, but they can't stop it....of the 2000+ natural arches in the park, 43 have collapsed in the last 30 years, rock slips are common, and even the famous "balance rock" is soon going to be in danger of tumbling down off its pedestal. If you haven't seen it you need to get here....Arches and Moab won't disappoint, I promise. After spending a day soaking in the park, learning about it's history and talking with people who all shared a common sense of awe and wonder at every turn, an amazing thing happened on day two. The night before we had an unseasonable and quite severe thunderstorm causing some major flash flooding, wash outs, and road closures. 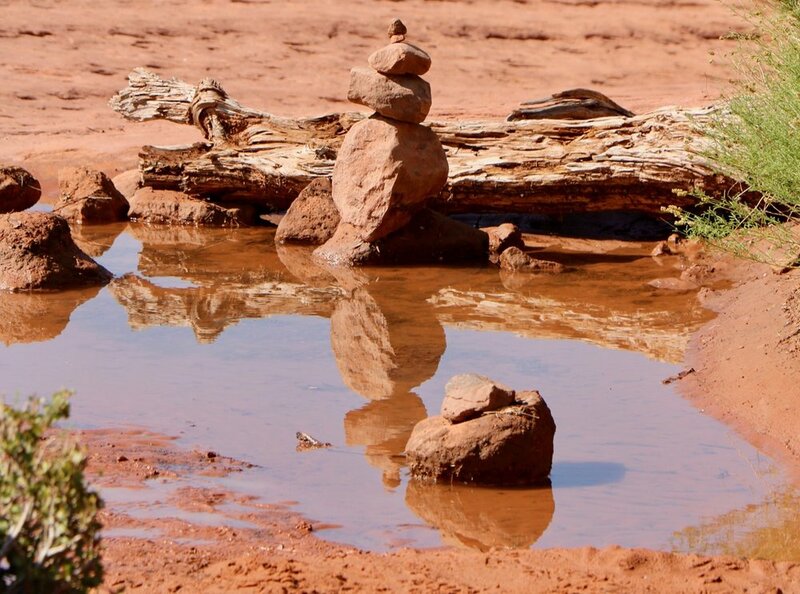 I arrived at the park to find that the main attraction that was certainly on the top of my list of things to see (and paint), Delicate Arch was closed as the access road was flooded. Disappointment filled the air and at each of my stops that morning it was all the talk. around 11am, word quickly spread that the access to the trailhead was opening, but not the road to the viewpoint which you can drive up to a scenic overlook. 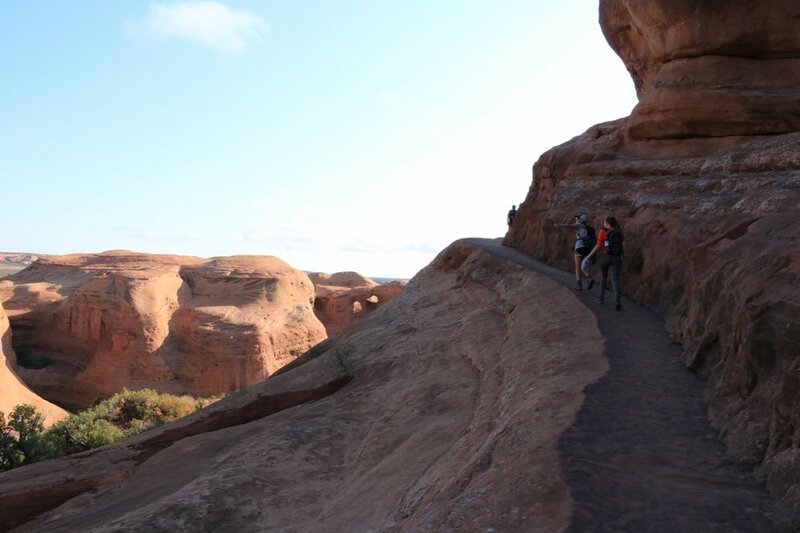 The hike into Delicate Arch is considered an difficult hike and not for every average Joe visitor - 2 miles one way, a continuous climb increasing almost 500 ft in elevation along the way while hiking on loose gravel, slick rock, and cliff ledges. But at the trailhead, I watched an amazing thing occur. while people from all stages and walks of life stood contemplating whether they could handle the hike up fueled by not wanting to miss out on seeing the crown jewel formation of the park, a handful of visitors who wouldn't think twice about tackling that trek started an amazing thing. Instead of blindly pushing through he gathering of people around the trailhead entrance, they began encouraging people to go for it, boosting confidence, sharing their trekking poles and extra water bottles. It was amazing to watch this moment of humanity unfold in front of me. 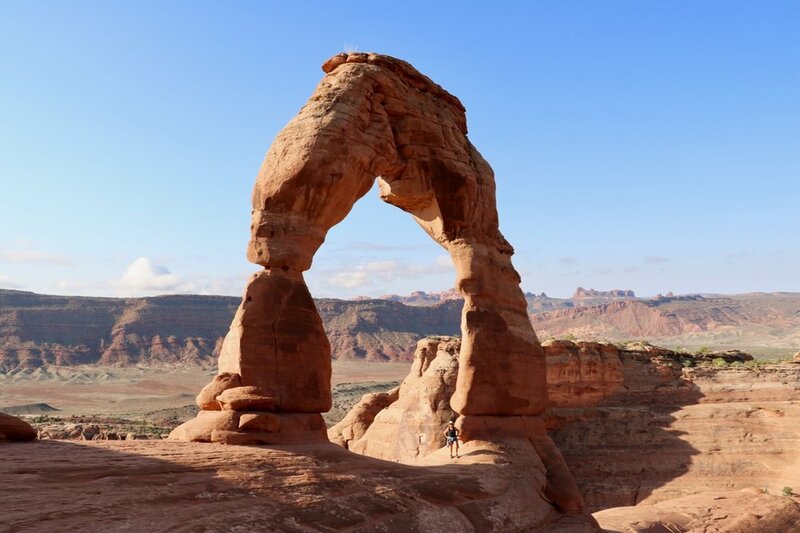 Sure enough, with the help of some spontaneous hiking coaches and impromptu motivational speakers, the majority of the crowd hit the trail and this pilgrimage to make sure EVERYONE could see Delicate Arch didn't end there. the avid hikers continued to walk with their recruits the entire way and slowly but surely made their way, stopping when people needed rest, offering a helping hand on a steep spot and talking them through the narrow ledges - one team making their way to the finish line. As people finally started trickling in to the arch, there were cheers, rounds of applause, hugs, and group pictures being taken, these people who were strangers a mere hour before were now bonded in such a special way. America at it's finest on a Friday morning in Moab, Utah. Inspired by the people around me, the beautiful structure in front of me, the perfect blue sky day, I sat down on a rock for the next hour or so and drew...the perfect outdoor studio with an terrific energy of comraderie. 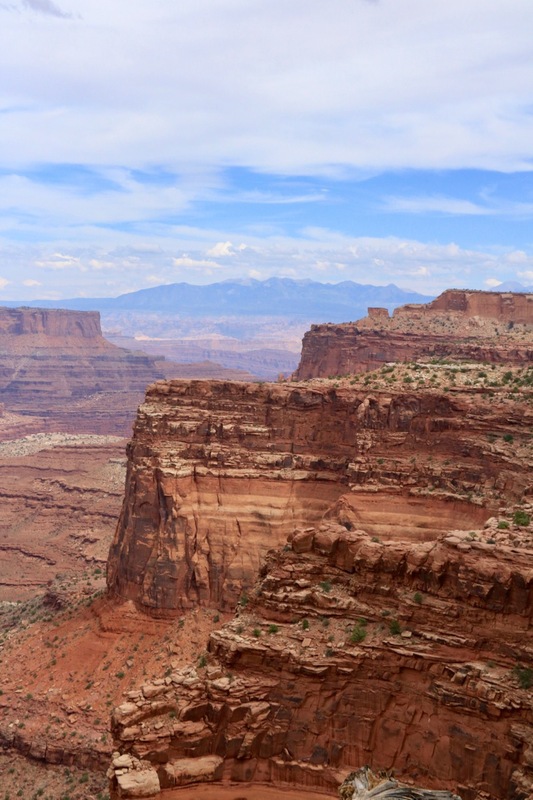 Newer PostCapitol Reef and Bryce Canyon National Park! Older PostRocky Mountain National Park!